My first trip to tea mountain was memorable. We drove over 600 kilometers from Kunming to Jinghong, the main city in Xishuangbanna. Exhausted on arrival, I was ready for a restful night’s sleep before the trip next morning to LaoBanzhang, the home of many ancient tea trees. I slept soundly and was still sound asleep when I was awakened by commotion out in the hallway. It was the noise from several domestic tour groups gathering their members to start their daily itinerary. Our group consisted of myself, tea master Vesper Chan, his wife and son, and a couple of local friends of Master Chan’s from Yuxi, a small town in Yunnan. We met for a quick breakfast at 8:00 a.m. at the hotel. During breakfast, Mr. Luo (one of the friends from Yuxi) briefed us about the weather and road conditions. He told us that it had rained all night and it might not be safe to drive up the tea mountain. He explained that the road up the mountain was a single lane and, if there was an accident, cars could be stuck on the road for hours or even days. Gazing out the window, I noticed it was still drizzling. After discussing various options, Mr. Luo suggested that we go ahead and drive to Menghai and then decide later whether to continue to LaoBanzhang. Along the way, the rain stopped and the sky cleared. After arriving to Menghai, we met up with Wang Tianming, a tea farmer from LaoBanzhang. Wang Tianming told us he had just come down the mountain and the road conditions were safe. This was music to our ears. 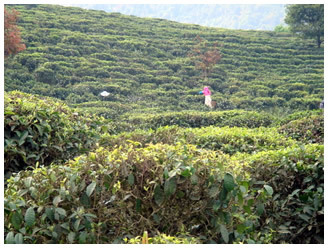 Filled with excitement and anticipation, I climbed into the jeep and we continued the journey to the tea mountain. The road on the early part of the trip was a narrow highway with farmland on both sides that included banana, sugar cane, corn and rice fields. After half an hour or so, the narrow road became even narrower and more rugged. About another hour, we came across a tea plantation filled with short tea shrubs planted neatly and densely in rows. In Yunnan, these tea plantations are called "Taidi Cha," which means "terraced tea." During the drive, I chit chatted with Wang Tianming. He told me he is of the Hani ethnic minority tribe but spoke fluent Mandarin because he worked in the city for a few years. He told me his tribe did not have a written language. He then related to me a Hani legend about three brothers: one was the leader of the Han tribe, the other was the head of the Aini tribe, and the third was the chief of the Hani tribe. One day they went on a learning expedition. The Aini head brought a piece of bamboo to record what he would learn. The Hani chief brought cowhide for the same purpose. The leader of the Han tribedid not bring anything with him because he planned to memorize everything he would learn. At the end of the expedition while on their way home, they encountered a terrible thunder storm. All that was recorded on the bamboo and cowhide was washed out by the rain. Wang Tianming said while smiling, "That’s why we Hani’s don’t have a written language." Yunnan Province is located in the Southwest of China and Xishuangbanna Dai Autonomous Prefecture is positioned at the very southern tip of the province. Xishuangbanna shares its southern border with Myanmar and Laos and its population is largely comprised of minority ethnic groups that share a heritage, language and culture with Thai and Laotians and not with the ethnic Han Chinese. This part of China is largely tropical rain forests, and as we drove further up the mountain, the landscape became increasingly green and lush. 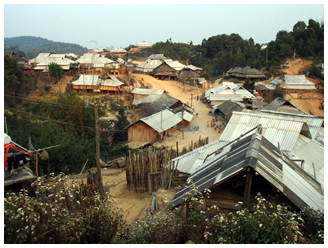 At about an elevation of 1,700 meters (approximately 5,000 feet), a small village of about 100 households came into view. Shortly thereafter, we arrived at Wang Tianming’s home. 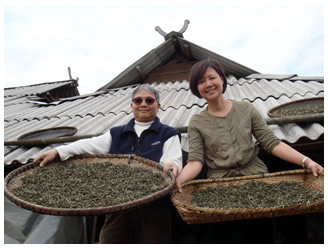 Wang Tianming’s family, as were the other villagers, were tea farmers. All the dwellings in the village were similar. The habitable part of the structure was raised on stilts, with the ground floor underneath used to store logs and domestic stock. The raised living quarters comprised a sparsely furnished room with a hearth in the middle for cooking. Above the hearth hung many bundles of cured pork. Outside was an unfenced deck where freshly pressed tea leaves were being sun-dried. More bamboo trays of processed tea leaves were being dried on the ledge of the roof. Attracted by the fragrance of the tea leaves, Master Chan grabbed a handful and brewed a pot of tea for all of us. This was the freshest tea I have ever had. After preparing a delicious lunch for all of us, Wang Tianming took our group to visit the famous Lao Banzhang ancient tea gardens. We trekked on a narrow trail along the mountainside. After about a fifteen to twenty minute hike, we came upon a grove of trees. There were many trees, large and small. Wang Tianming patiently pointed out to us those that were tea trees and recited their respective ages. Some tea trees were as tall as 15 feet. I came to understand why teas made from these old trees are so highly sought-after. They were planted from seeds and thus are diverse biologically. 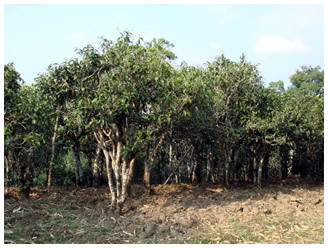 In addition, these trees were allowed to grow naturally with an abundance of mineral content from the soil - a major contributing factor to good tea. We spent several hours in the forest examining the tea trees, chewing raw tea leaves and listening carefully to Master Chan’s explanations. 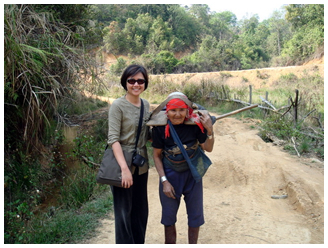 From time to time, we saw tea pickers picking leaves from the trees and transferring them to baskets that they carried. Among them, I saw an elderly lady in ethnic clothing carrying a basket strapped around her forehead that was full of tea leaves. I asked her permission to take a photo with her. She said shyly, "I am already 80-years-old. Why would you want to take a photo of me?" After my repeated pleadings, she finally acquiesced. During dinner, the Hong Kongers among our group raved about how delicious the chicken was because they were free range and naturally grown. In Hong Kong, free range chicken is called "walking chicken." The villagers were puzzled by the term. They answered, "Of course they walk." They then asked, "Are the chicken in Hong Kong flying chickens?" (In Mandarin, the term "flying chicken" (feiji)sounds the same as the term for "airplane".) We all laughed heartily. Away from the allures of civilization, the villagers did not have much to do at night except to gather around the hearth, tell stories and drink their home-made moonshine. Imbibing alcohol was the villagers’ favorite pastime. We were forewarned that if we started drinking with them, we would have to drink until we got drunk. Otherwise, it would be considered disrespectful. At the end of the evening, our friends from Yuxi, including our driver, became unconsciously drunk. This posed a difficult problem as our luggage was still locked inside the trunk of the car. Arrangements were made for the ladies to sleep at the house next door to Wang Tianming’s. Although the amenities were sparse, I could tell the host did his best to accommodate us, even allowing us to use a red quilt embroidered with the Chinese character Shuangxi (double happiness) that was given to his brother for his wedding the year before. I was very touched and grateful for his thoughtfulness. The sky was still dark when I was awakened by a rooster’s crow. I looked at my watch and it was still only 4:40 a.m. I tried to go back to sleep but there was again another rooster’s crow. I accepted that it was time to start my day and rolled out of bed. Dressed in warm clothing, I eagerly stepped out into the morning air. I took a deep breath, and feeling refreshed, took a stroll around the village. I felt enveloped by a strange, yet very comfortable and peaceful feeling. It was so quiet, the only sound was that of the villagers stirring and rising to begin their day’s work. I had been transported back in time. There were no cars, no traffic. Just chickens, pigs, and chirping birds. When I returned to the dwelling, I saw Wang Tianming’s aunt firing tea leaves in a wok. I recognized the process that she was engaged in was called "killing the green," which purpose is to halt the oxidation of the leaves. I watched her finish processing the freshly- picked leaves and place them on the deck to dry. After eating breakfast, it was time for us to leave the mountain. It had been a short trip but, on this brief two-day journey, I saw rare centuries-old tea trees, picked and tasted fresh tea leaves from the old trees and observed the centuries-old art of processing pu-erh tea, and experienced the kind hospitality of Hani tea farmers. It was exhilarating, edifying and memorable. I knew I would have to return. And I have…many more times.